We eat breakfast for dinner quite often. But do know you what's even better than that? Brunch! Brunch means you get to eat tasty breakfasty items in the morning but get to sleep in later than usual. The kids had a sleepover with several of their friends. We all stayed up way too late and enjoyed sleeping in. I love to cook for a larger group so when Eggland's Best invited me to try their eggs again and host a brunch, I knew that this was the perfect time to do it. I notice a difference when I use Egglands Best eggs. They seem to cook up fluffier and just taste better. Check out Egglands Best website or their facebook page for delicious recipes. My kids declared this the best french toast they ever had. They syrup is truly scrumptious! I used chunky peanut butter so the texture wasn't as pretty but I received no complaints. We also enjoyed fresh fruit and a ham, egg and potato casserole that I will share in a couple of days. Egglands Best sent me this wonderful gift package. The bag is waterproof and my daughter now uses it as her swim bag. The bowl is very thick and sturdy and is a fantastic mixing bowl. 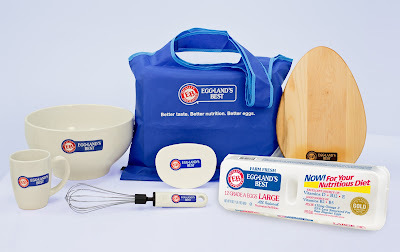 Egglands Best wants to give you an opportunity to get one of these gift packs along with some free eggs. Just check out their tasty recipes on the Egglands Best website and let me know which recipe looks good! I'll pick one winner by next Friday the 5th to win this awesome gift package. Giveaway closed. 2. Place eggs, cream brown sugar, cinnamon and vanilla into a large mixing bowl. Whisk to combine. One at a time, dip each slice of bread, both sides into egg mixture. I used both French bread and cinnamon bread. Add a tablespoon of butter into hot skillet to melt, swirling pan. Add egg dipped bread slice to skillet, cooking 1-2 minutes per side or until golden brown and cooked through. Transfer cooked piece of toast to a clean plate and repeat until all bread has been used. 3. Place maple syrup and peanut butter into a skillet over medium heat. Stir to melt peanut butter into syrup. Stir in vanilla then heavy cream. Let mixture bubble for about 5 minutes, stirring often to thicken. Add sliced bananas and cook for 1 minute. Pour peanut butter syrup sauce and bananas over warm French toast. Serve immediately.